It’s free to become a member of CCAT and requires no fixed time commitments – your support will make all the difference to the strength of our organisation so please consider signing up. Commitment: There is no fixed time or cost commitment to our membership, and no donations are required. 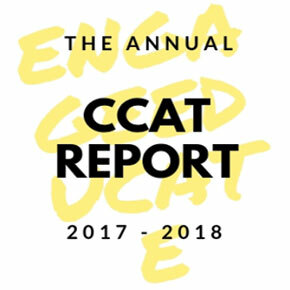 If you’re interested in supporting the work of CCAT you can make a huge difference to our cause just by joining. Why we want you: By adding your name to our growing list of supporters you’ll add weight to our campaigns, and receive news of our organisation and activities. We are growing in size each year and there is strength in numbers! 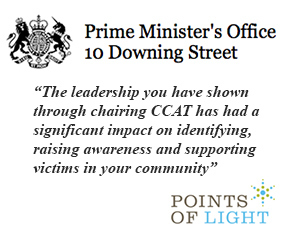 Join our mailing list to receive seasonal bulletins about the work of CCAT and to support forthcoming campaigns and events. Subscribe to our Facebook and Twitter channels to receive regular news updates and promote awareness of our work to your network of friends and family. We can campaign collectively for change through our members’ signatures; the more members we have the greater the support we can achieve. Fundraising and events are key sources of income for us as a charity, and the best ideas often come from friends and members. Even if you don’t have the time to volunteer yourself, your brainwaves and initiatives are always welcome! Our members provide links between us and other organisations in your community. We can come and give a talk at your school, work place, church or community group, for example, and we’re always delighted to hear from willing partners who can help us in the challenge of eradicating human trafficking. The best form of advertising – your voice can be the difference between someone knowing about CCAT or not, and they could have a big contribution to make. The more members we have, the higher our profile and the more awareness we can achieve. Join us throughout the year for our fundraiser concerts, sponsored walks or theatrical performances. Just by coming along or bringing your family and friends you’ll have made a big difference in helping us reach raise funds and share our message. Many of our members make voluntary annual donations (although this is not essential). Contributions are welcomed on a one-off or regular monthly/annual basis, from individuals or organisations. You can also support our volunteers in their individual fundraising efforts by making donations when they appear on our website. How to join: To join CCAT, simply send us an email using our contact form stating that you’d like to become a member, and include your up-to-date contact details. We’ll get back to you with a confirmation and add you to our mailing list as soon as possible and you’ll be added to our database*.In the meantime, you can also subscribe to our social media updates by following us on Facebook and Twitter. Notes: * Your details will be held confidentially and you can unsubscribe from your membership at any time. * You will not be asked for any fees; membership is free of charge.If you’d like to make a voluntary donation to CCAT, more details can be found here.